West Indies 2-131 (Lendl Simmons 63, Dwayne Bravo 38, Chris Mpofu 2-14) beat Zimbabwe 8-130 (Malcolm Waller 49, Craig Ervine 34, Tino Best 3-18) by eight wickets. Zimbabwe scored 130 runs for the loss of 8 wickets in the allotted quota of 20 overs. West Indies chased the target successfully by hammering 131 runs with eight wickets in hand in 16.1 overs. Lendl Simmons (West Indies) was declared ‘Player of the match’ for his majestic unbeaten knock of 63 runs. The first Twenty20 of the two match series was played on Saturday, March 2, 2013, at Sir Vivian Richards Stadium, North Sound, Antigua. Earlier, Brendan Taylor, the skipper of Zimbabwe, won the toss and asked his batsmen to bat first. Vusi Sibanda and Hamilton Masakadza opened the innings and the first hit 3 fours before he lost his wicket on the last ball of the third over for 13. Brendon Taylor was unable to score any run and Masakadza became the third victim at 28 in 4.5 over after scoring just nine runs. Craig Ervine and Malcolm Waller got together and put some life to the match by sending the ball out of fence at regular intervals. Ervine was the most attacking of the two and hit 5 fours until the end of the 13th over as Waller shared two. The score was taken to 88 in 15 overs as Craig Ervine was stumped by Denesh Ramdin off Sunil Narine for 34 off 39 balls with 5 fours. Waller hit a couple of sixes in the 17th over off Darren Sammy and he was clean bowled by Sunil Narine for 49 off 34 deliveries with 2 big sixes and 4 fours. The incoming batsmen were unable to impress and the visitors managed 130 runs with two wickets left at the end of the 20th over. Tino Best was at his best and grabbed three wickets, Sunil Narine and Dwayne Bravo shared two whereas Samuel Badree held one wicket. Johnson Charles and Lendl Simmons started off briskly for the Caribbeans and the first punished Kyle Jarvis for 5 consecutive fours in the third over. Charles was declared leg before wicket off Chris Mpofu for 26 from 6 fours and was replaced by Darren Bravo. Simmons added 15 runs in the fifth over with 2 big sixes as Darren Bravo lost his wicket for a duck in the following over. Dwayne Bravo walked in next and hit the first four of his innings in the eighth over and got another 11 runs with Simmons in the 11th over. Lendl Simmons dispatched 2 more sixes in the 13th over whereas Dwayne Bravo carried on with his attack with another six and a four. Simmons smashed his third T20 fifty in the next over as the Windies required just 19 runs to win the game in the last 36 deliveries. He got his 6th six in the 17th over as the home side reached the target by thrashing 131 runs after losing just two wickets and 23 balls to spare. Lendl Simmons remained unbeaten for 63 off 49 mere balls with 6 towering sixes and 1 four whereas Dwayne Bravo secured his side with 38 from 30 with 1 six and 3 fours. Chris Mpofu was the only successful bowler among five who claimed two wickets which fell during the Windies innings. 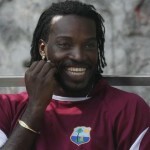 West Indies won the match bravely by a gigantic margin of eight wickets and lead the two match series 1-0. The second T20 will be played at the same venue on March 3, 2013.